After the consolidation of its structure, DDL realised it was time to contribute to projects related to social responsibility, retributing what was proportioned for its arrisal and current development. Since 2012 DDL has become a donator of the Insper Scholarship Funds, a project that attempts to raise financial resources for scholarships supporting students that obtained the academic qualification to join Insper, - a college well known for its high quality courses - but do not possess the resources for it. DDL believes that education is the most appropriate path to build a society that is more just and has more opportunities. DDL has also helped the society by taking part in campaigns promoted by GRAAC - famous entity responsible for supporting the treatment of children with cancer. The GRAAC withdrew DDL’s attention for its reputation, organization, capability of showing improvement and, specially, for the personal aspect of its collaborators. 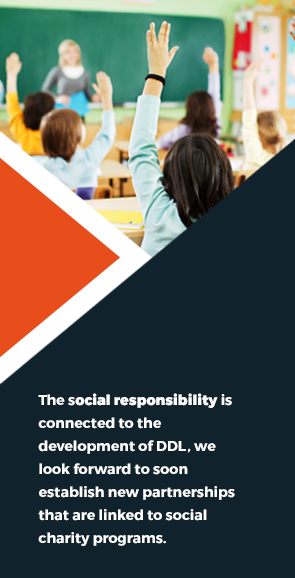 The social responsibility is connected to the development of DDL, we look forward to soon establish new partnerships that are linked to social charity programs.